Please accept my blessings. I am so much obliged to you for your valued cooperation in spreading my movement of Krsna Consciousness throughout the whole world. I beg to acknowledge receipt herewith of your contribution of $19,000 (nineteen thousand dollars) for publication of my book, Krsna, now going to the press within the week. Please note that every farthing of this money will be employed in the service of the Lord, and the Lord is so kind and grateful that He will bestow upon you benediction at least ten times more than that you have done for Him. It does not, however, mean that Lord Krsna is like a business man, and He bestows benediction when He is profited by our service. The Lord is full in Himself; He does not require our service, but if we render service unto Him in love and devotion, such action enriches our very existence. The example in this connection is given that when a man decorates his face, he does not feel much enjoyment because he cannot see his own face. But he enjoys his beautiful face when it is reflected on the mirror. In other words, when a living entity, by rendering service to the Lord, feels happy, the Lord enjoys the situation. under the guidance of Lord Caitanya, certainly they will be happy. souls. Both of you are pledged to do something for the peace of the world. By the grace of Krsna, you have already realized to some extent about the necessity and importance of Hare Krsna movement in the world. Similarly, if John also does so, it will be a great event. John and his wife were very kind upon me when I was staying at Tittenhurst Park as their guests. I always prayed for them to Krsna for understanding this great movement. Please inform him this message on my behalf. I have dreamt something very nice about John which I shall disclose in proper time. In the meantime, please ask him to cooperate with this movement as you are doing, and he will be very happy. Please try to understand the philosophy of Krsna Consciousness in a nutshell: Every living entity has a dormant propensity to love somebody other who is very excellent in his opinion. Everyone of us therefore wants to love somebody else, attracted by his different varieties of opulences. Somebody loves some other either on account of riches, power, popularity, beauty, knowledge, or renunciation. But this loving propensity for somebody else is fundamentally meant for the supremely rich, powerful, popular, beautiful, wise, and unattached Lord Krsna. Everyone is hankering after loving the Supreme Personality of Godhead, but none of them has the right information. By Krsna Consciousness movement we want to broadcast this information that if anyone reposes his loving propensity upon Krsna, he will immediately feel full satisfaction, as much as he feels full satisfaction by supplying food in the stomach. Otherwise, everyone will be frustrated. 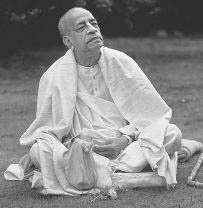 Please try to understand this simple philosophy by critical analysis, and I hope by the grace of Krsna you will be a great servant of His in fulfilling His desire that He may be known by His Holy Name in every village and every city all over the world, and thus the people will become happy. Hope this will meet you in good health and shall be very much pleased to hear from you.